Let’s talk about connecting to the audience — Why is this important? Whether you are a novice, intermediate or seasoned screenwriter, this webinar will fuel you with insightful and important information to help you create a story with universal appeal. Gain a deeper understanding about the fundamental importance of conflict in a screenplay. 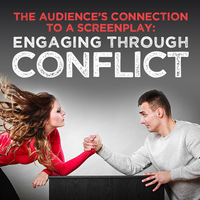 Learn how conflict affects the pacing of your story, helps develops your main character, and connects the audience to the hero. Please note: If you purchase any webinar, you will get a recorded version of the webinar sent to you after the presentation day. So if you can’t attend live, you will still get all the materials. Screenwriting is a rigorous process, and for a story to work in this medium the audience must connect to the hero – you must make the audience care! However, this does not come about by giving your character good personality traits. The audience needs to see strength in overcoming; they need to see “reality” through conflict. Carla’s passion for storytelling begins with her connection to the journey of the hero, and for an audience to root for a hero; there must be a relationship with the character based on weakness and character defect. With a background in the dramatic arts, and English literature, Carla will share with you her process for creating relatable, “realistic” characters through the use of conflict. Discover why so many scripts fail at the get go, how good characterization is based more on weakness and need than personality traits, and how both internal and external conflict is used to move the story forward and bring the hero to transformation. This webinar includes both access to the live webinar where you may interact with the presenter and the recorded, on-demand edition for your video library. Each registration comes with access to the archived version of the program and the materials for one year. You do not have to attend the live event to get a recording of the presentation. In all webinars, no question goes unanswered. Attendees have the ability to chat with the instructor during the live event and ask questions. You will receive a copy of the webinar presentation in an e-mail that goes out one week after the live event. The answers to questions not covered in the live presentation will be included in this e-mail as well. Carla Iacovetti is a published writer, awarded poet, and screenwriter. She has authored more than a half dozen screenplays, and her poetry is featured in over a dozen anthologies. Carla, who works as a freelance writer, script editor, ghostwriter and copywriter, is also a regular feature writer for the Ventura County Reporter and is a screenwriting instructor at Santa Barbara City College Center for Lifelong Learning. Do you want to write a screenplay? What’s up with universal appeal? So, you want to write a screenplay that has universal appeal (don’t we all)? There are a couple of major things you need to focus on for that to happen: Your plot and the reason for action. So, often times, action is a emotional response of the character’s need or want. 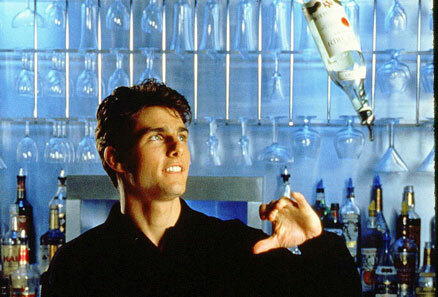 For example: Remember the movie Cocktail (1988), which starred Tom Cruise and Elizabeth Shue? Let’s look at the storyline. Brian Flanagan has just gotten out of the service and wants to make money. He wants his own business, but after being turned down in several job interviews for lack of education, he takes a job working as a bartender. His need for money pushes him to take a job that he’s really not excited about. However, his need produces continued actions (chains of events), to include traveling to Jamaica to work as a bartender at an upscale resort, and meeting Jordan Mooney, the seeming love of his life. His boss, Doug Coughlin also wants to own his own high-end bar, so the two come up with a game-plan. Once again, this flawed protagonist has an agenda, and his need gives rise to action, pushes the plot forward and will eventually guide the story to resolution. Universal appeal is important because for an audience to relate to a character or story there must be a relationship with the character and the storyline. So, when Brian Flanagan’s business partner (the antagonist) puts him to a dare, we (the audience) feel bad for him, because it seems like all is lost. We’ve all been there. Desire and need are powerful things. We somehow relate to his plight, his frustration, his turmoil, and that is universally appealing. Is universal appeal important? You betcha! Life is a journey, and we are all a part of it. For an audience or reader to relate to a character, there must be character traits, familiar moments that we’ve walked through or witnessed. We know how this character feels because we’ve been there and done that! Just a little writing tip, in case you’re in the midst! What the heck does your character want? Simply stated, want produces action. Think about it…If you suddenly developed a toothache, what would you inevitably end up doing? You’d call your dentist. Here’s a good question to ask yourself when your creating a main character. What is the inciting incident established for the main character? You know…something that must be gotten or achieved. Something that the character believes will ultimately make his or her life better. Here are some examples of (obvious) external goals: money, love, career promotion, the love of a child or family member, etc. Whatever this goal is, your protagonist must feel that this goal is essential to his or her life, and the audience must see that the character will suffer or loose out “if” he or she does not achieve this goal. This connection is paramount between the main character and the audience. 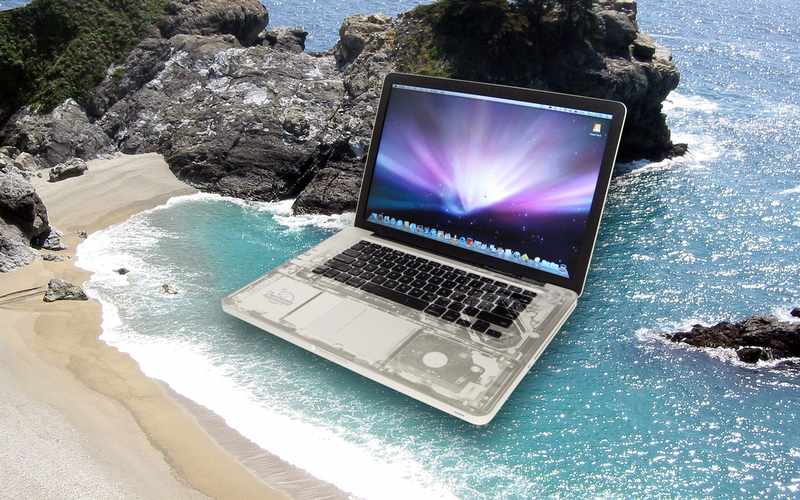 If it’s not there, you might lose your audience along the way. The character won’t be compelling and the audience won’t want to root for him or her. 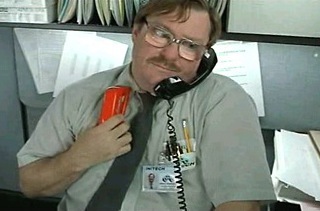 Milton’s worried about his red stapler…but that’s just the beginning. The Shoe Fits! Disney’s Cinderella Triumphs! It’s not easy to successfully remake an age-old fairy tale, and particularly one as renowned as Cinderella, but once again, Disney triumphs. First of all, choosing Kenneth Branagh to direct this live action version of their original animated film (1950) was a terrific decision – it’s hard to go wrong with the talented and famed actor, director, producer and screenwriter from Belfast, Northern Ireland. Undoubtedly, his understanding of both story and character arc, especially as related to his pronounced knowledge of Shakespeare can be seen in his ability to re-visit and revise this classic tale. In addition, Branagh was trained as an actor at the Royal Academy of Dramatic Arts, and has acted over the span of his career. Since he has been on both sides of the fence, it gives him some advantages because he’s connected to the audiences perspective, and this makes for powerful directing. This updated version of the classic story is fresh, sweet, sometimes amusing and altogether lovely. 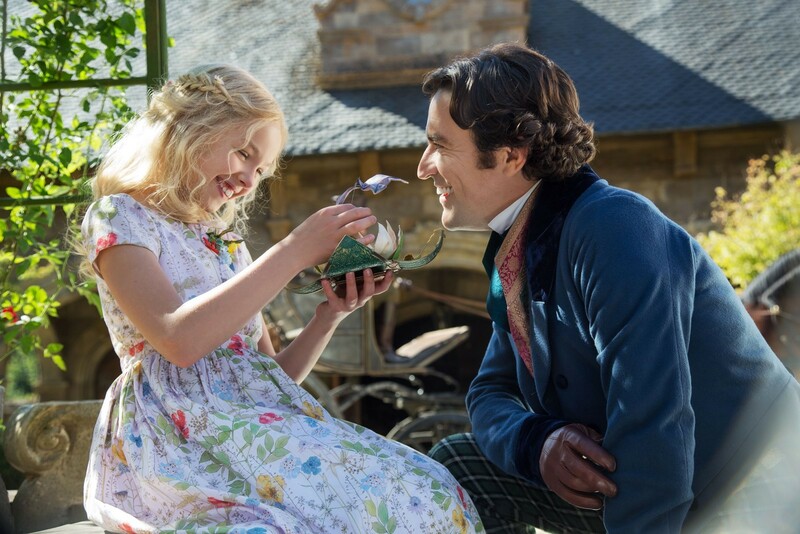 While screenwriter, Chris Weitz sticks to the over-all original version, he does throw in a few nice surprises, such as the opening scene where Prince Charming (Richard Madden…he’s incredibly charming) and Cinderella (Lily James) meet on horseback. 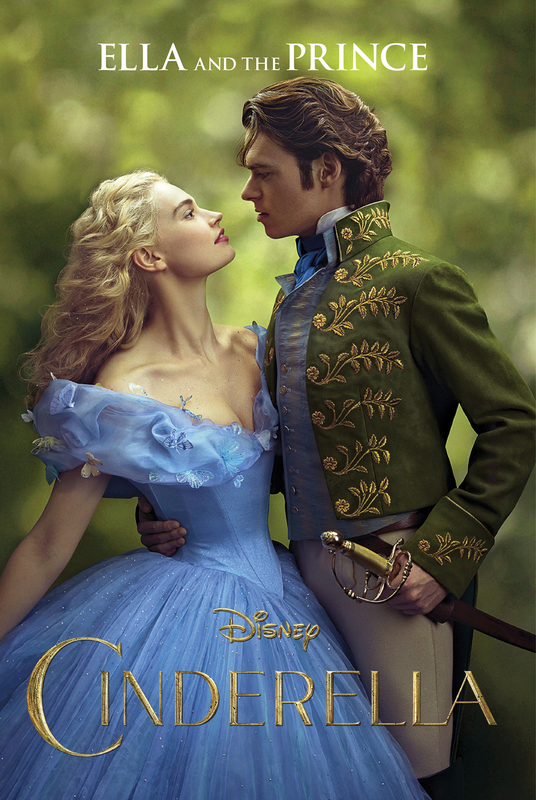 Cinderella is wonderfully engaging, charming, sincere, trusting and quite down-to-earth. There is nothing magical about her character, in fact, there is a wonderful message of strength of character that emanates to audiences of all ages. She’s not a victim, nor is she feeble — she stands strong. 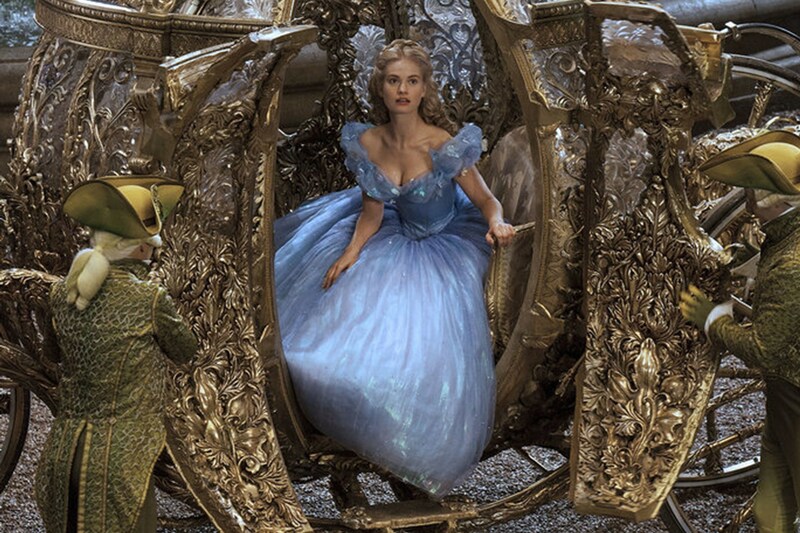 Cinderella is refreshingly real. She holds fast to memories of a happy time when her parents were alive, and rather than give way to anger or bitterness as a result of harsh life circumstances, she matures and her beauty radiates from the inside out. 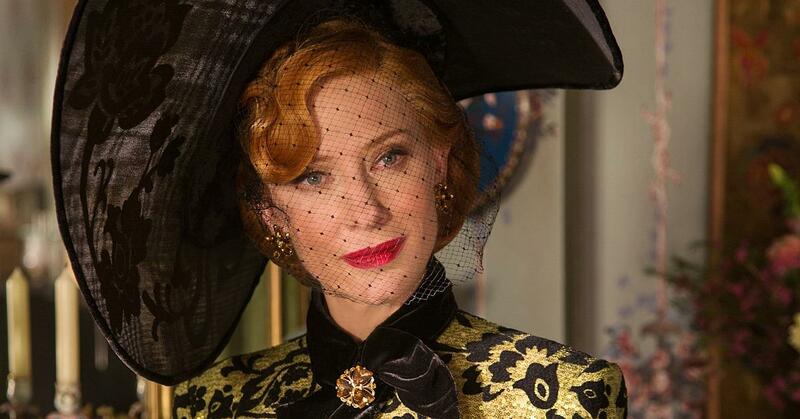 Cinderella recalls her dying mother’s instructions to, “Have courage and be kind,” and this becomes her life refrain, whether it’s in the way she connects to animals and or responds to Lady Tremaine, her cruel and calculating stepmother (Cate Blanchett), or in her interactions with her two vain, argumentative and imprudent stepsisters, Drisella and Anastasia (Sophie McShera and Holiday Grainger). 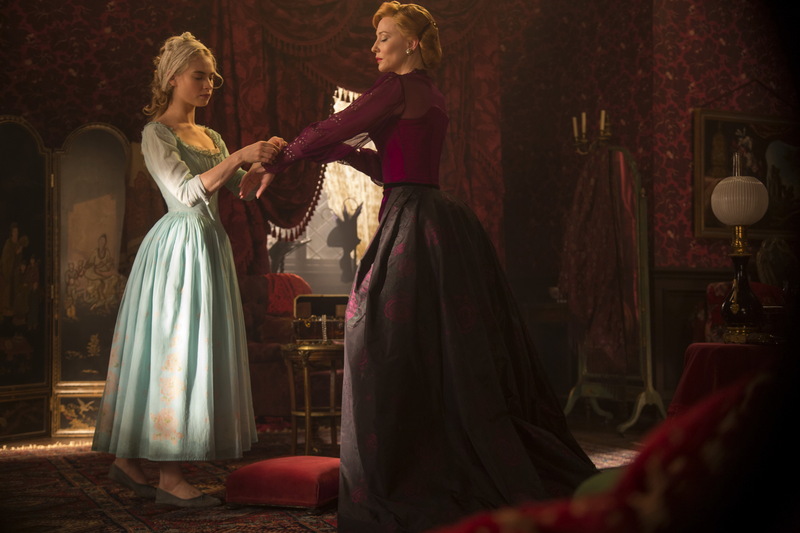 Instead of the typical “evil” stepmother as one would expect, Lady Tremaine is far more realistic. Granted, she is calculating, cruel, malevolent and abusive, but this antagonist is not the typical Disney villain. 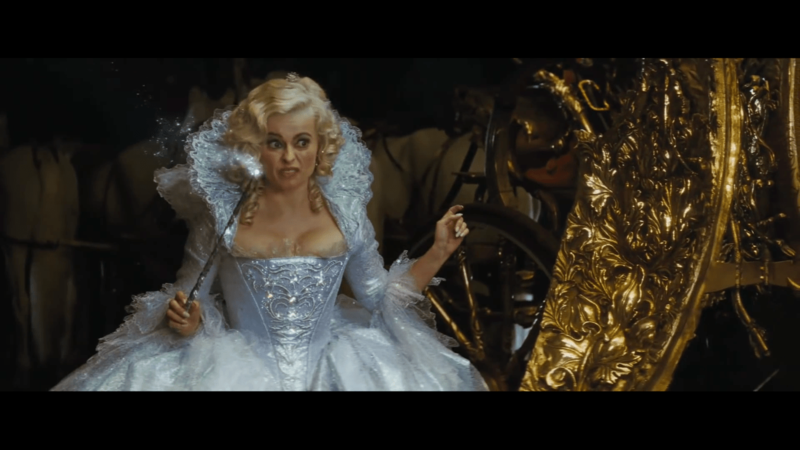 She is actually more believable, and for a brief moment, we don’t see hatred at the helm of her cruelty, but the need to provide for her two daughters and Cinderella is a rival. A fabulous cast, a fabulous director and superb writing are at the helm of this remake, and that’s only the beginning. 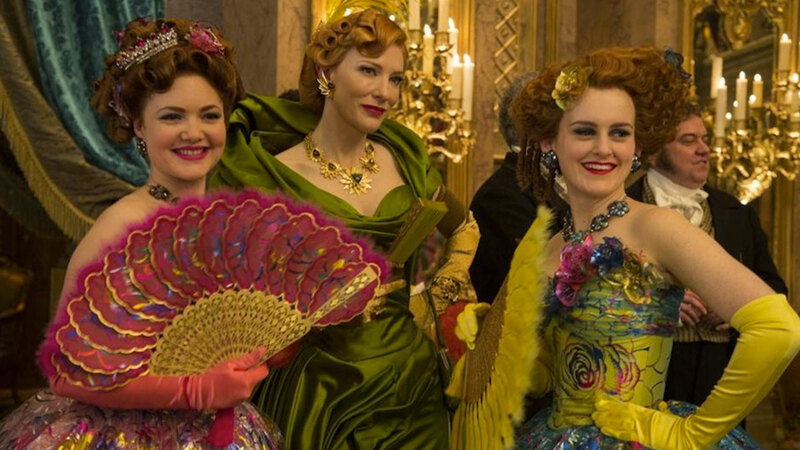 Dante Ferretti’s set designs are nothing short of spectacular and Sandy Powell’s costume designs are simply amazing — in fact, they’re completely flawless. It’s no wonder Rotten Tomatoes gave Cinderella an 84% rating. Both my thumbs are up! Oh, and ladies — make sure you take some tissue. I’m very happy for those who won Oscars tonight and for those who were nominated. As a screenwriter, I wholly appreciate the vehement amount of creative energy, work, talent and bold tenacity that goes into every film made. BRAVO to ALL!